The Radisson Blu Mammy Yoko has partnered with the SOS children’s Village to award certificates to 12 grandaunts, who received training in catering, engineering, housekeeping and hotel management. The certification ceremony, which was hosted at the conference hall of Radisson Blu, was part of the hotel’s corporate social responsibility. 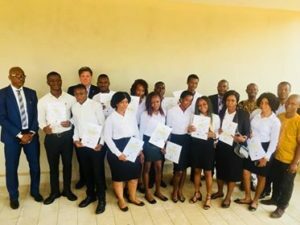 General Manager of the hotel, Johan Klang, said the skilled training program was a Youth Career Initiative (YCI) – a large multinational NGO based in London. He disclosed that the training went through several stages within a six-month period and that at the end of every month, exams were conducted to test the ability of students. National Director of SOS Children’s Village, Andrew Chikopa, extended appreciation to Radisson Blu Hotel for the opportunity given to the youth to build entrepreneurship skills through the YCI. He asserted that the YCI has helped to foster technical expertise locally and has helped built the capacity of youth to become competitive in the labour market. Mr. Chikopa told the hotel management that SOS would continue to create the platform for every youth to grow into a resilient individual. Deputy Minister of Youth Affairs, Mr Lusine Kallon, showered praises on the grandaunts and expressed delight not only as a government minister but also as a youth, who wanted the empowerment and development of the country. He opined that youth were marginalised and deprived of participation in state governance, but that with the inception of the New Direction, that narrative has changed. He stated that President Bio started his campaign with actions and positive development for the youth of the country. He said the Ministry of Youth Affairs would always partner with the needful persons to change the narratives for youth empowerment and that they would continue to encourage other humanitarian organizations to follow the footsteps of Radisson Blu and its partners with regards youth empowerment.